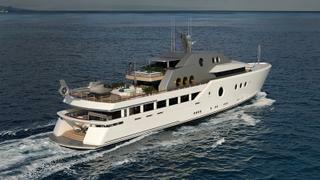 Italian yacht designer Luca Vallebona has unveiled a 62 metre explorer yacht concept called Broadway. 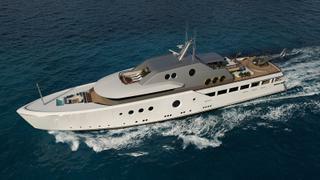 This new concept comes hot on the heels of Vallebona’s 82 metre Pentagramma design, which was released in May 2018, while Vallebona was also responsible for the design of 42.4 metre MondomarineSerenity. As the name suggests, Broadway is inspired by Manhattan’s famous theatre hub, as well as the grid-like layout of modern New York City, and would be built with a steel hull and aluminium superstructure. Displacing around 1,100GT, the yacht’s exterior is characterised by elements recalling a golden age of discovery with brass-framed porthole windows and pillars above the main deck bulwarks. Much emphasis has been put on outdoor living on board Broadway, with a spa pool and seating area with fire pit forward on the bow and numerous terraces – including a private owner’s terrace on the bridge deck. 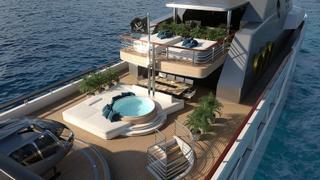 The concept also includes a large beach club aft and an upper deck pool with sunpads and a helipad which can be transformed into an additional sunbathing area or dance floor. Inside a double-height main saloon can be accessed directly from the lower deck gym/diving area and beach club via a staircase. Large sliding windows on either side of the saloon offer access to folding balconies that each feature two catamaran-style hammocks which, Vallebona says, serves to decrease the formality usually felt in this area. The main saloon would also house a bar and dining area while forward of this would be a generous crew area, galley and wine cellar and day head which could be joined on to the main saloon via sliding walls should the owner wish. “I wanted to imagine that these two worlds, often hidden one from the other, could be joined through a simple system of moving walls, so crew and guest areas could lose their limits to become a connected space to be lived in together. This is an opportunity to look at the new generations considering a new way to use spaces and create relationships aboard in a less formal way,” said Vallebona of this unusual design decision. Accommodation for 12 guests includes an amidships owner’s suite on the bridge deck, accessed via a private staircase and split over two decks including a raised private terrace forward. Four further cabins are located forward on the lower deck while this space also offers a full-beam multi-use area with two fold-out balconies which could be used as a fifth cabin, spa, playroom or similar.